The natural process of the decomposition of organic material into a soil amendment is known as composting. Yard trimmings make up over 15 percent of the waste stream in Texas. Another 20 percent is food scraps, clean wood material, unrecyclable paper, and other easily composted materials. These materials can be saved from the landfill and converted to compost either individually or at centralized facilities. Click a title below to expand content. In the natural world, composting happens as leaves and other organic materials pile up on the forest floor and begin to decay. Eventually, the soil reclaims the material, which provides nutrients to the living plants nearby. 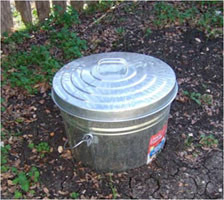 Backyard composting is simply a method for speeding up the natural process. The critical ingredients in a compost pile are air, water, browns and greens. Browns are the source of carbon. Browns are dry materials such as dried leaves, wood chips, evergreen leaves, paper and straw. Greens are the source of nitrogen. Greens are moist, fresh materials such as grass clippings, manure, blood or cottonseed meal, coffee grounds and fruit and vegetable scraps. Find a suitable location for your compost pile. As bugs will assist in the composting process, place the pile at least two feet away from any type of structure. A bin can be used to keep the pile tidy and protect the pile from wind and rain. Either build or buy a bin. A bin can be as simple as a cylinder of chicken wire. 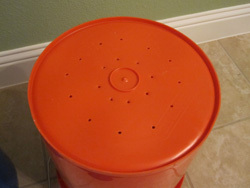 There are numerous sources for compost bins on the Internet. To retain heat and moisture, the pile should be at least 1 cubic yard. The bin should not have an area larger than 5 feet by 5 feet as aerating a pile that large would be too difficult. Find carbon (browns) and nitrogen (greens) to add to your compost pile. The optimal environment for bacterial growth is a carbon to nitrogen ratio of 30 to 1 by weight. Overcompensate had provided some rules of thumb to help achieve this optimal ratio. If you are composting leaves and grass, gather about 60% leaves and 40% fresh grass. If you have some fresh materials and some dry materials, gather equal amounts of each. If you have both vegetative and animal matter, gather 20% vegetative and 80% animal. Add the browns and greens to the pile in alternating layers, adding water as you go. Make sure that the browns and greens are in contact with each other by either having very thin layers (about 4 inches) or by mixing the brown and green layers with a pitchfork or other garden tool as you add them. The pile should be approximately 45 to 50 percent water or as damp as a wrung-out sponge. Cover the pile with a tarp, plastic bag, or other impermeable surface to keep in moisture and prevent over-watering from rain. In two to four days, check the temperature of your compost pile. Either use a compost thermometer or simply stick your hand into the pile. The pile can reach temperatures of 140 degrees F so please be careful. If the pile is not hot, add more nitrogen (greens). If the pile smells, add more carbon (browns). Be sure to mix the new emergency additions into the existing pile and add moisture if necessary. Monitor the moisture of your pile. There should be enough water that it almost drips from your hand when you squeeze a handful. Add water as necessary. Aerate the pile by either rebuilding the pile or turning with a pitchfork. To minimize the amount of time it takes to compost, aerate the pile when the temperature in the pile begins to drop. If you aerate about once a week, the pile should be ready for use in the yard in about one month. 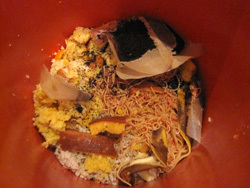 Compost is ready when the heat of decomposition has dissipated and most of the original ingredients are unrecognizable. Some people may opt for the cold composting method. Simply add organic materials to a pile or bin as they are generated. Add water from time to time to achieve the moisture content of a wrung out sponge and in six months to a year, the bottom portion of the pile will be a rich compost. To maintain a lawn or garden, sprinkle a half-inch layer of sifted compost once each year and water it in. Use compost as about one-third of a potting soil mix to add nutrients and to control fungus. Bokashi is an anaerobic (no air) decomposition process. It is fermentation - think "pickles," "wine," or "yogurt." It is simple to do, provides fast results, puts off little to no smell, and can be convenient for all homes. You can compost all of your food scraps right in your own kitchen, garage, or patio. Bokashi means "Fermented matter" in Japanese and has been practiced by farmers in Japan for centuries. Only recently has Bokashi made its way to the U.S. While the end result is similar, there are several key differences between the Bokashi method and the Digester method. The main difference is that Bokashi uses beneficial microbes, or living microscopic cellar organisms, while traditional composting uses heat and soil microbes to break down plant matter. The Bokashi method allows you to compost all of your food scraps, and not just the plant based food waste. This results in higher quality compost that has more nutrients and beneficial microbes for your soil. You can purchase commercially produced Bokashi systems or you can easily create your own for a fraction of the cost. 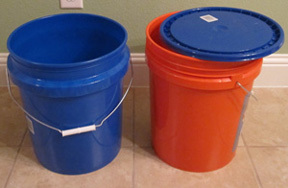 2 buckets – two of the same bucket so they can stack inside each other and leave a gap at the bottom. You can get these at your local home improvement store or you can go to a sandwich shop/ deli that serves pickles and ask for any empty pickle buckets they have. 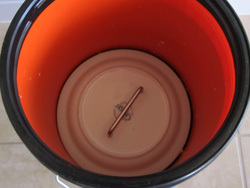 1 lid – You can use the lid that comes with the buckets you got or purchase a screw on lid system to make it easier to open. 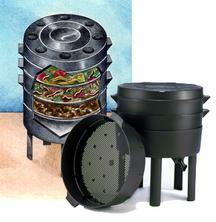 1 plate – This will be your “mid lid.” It should fit nicely inside the bucket. A nicely weighted ceramic dinner plate works extremely well. Your local thrift store is a good source for this. 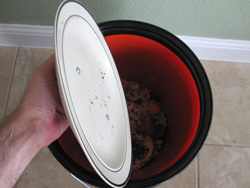 Do not put in aluminum foil, wax paper, plastic plates, plastic silverware, etc… Only food waste should go in the bucket. If you can eat it, it can go in the bucket. 4. Use your plate or "mid lid" to press down and remove the air. Leave your mid lid on top until you are ready to add more. This helps keep a little bit of pressure on the food and the air in the bucket off of the top layer. 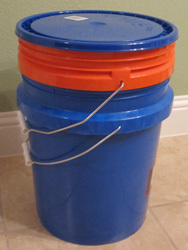 Depending on the type of food you put in the bucket and the amount of Bokashi mix you use, the reservoir at the bottom (the second bucket) will fill with liquid. This liquid or leachate is often referred to as "bokashi tea" or "bokashi juice." If the reservoir gets full, you will need to empty it. You don’t want your food scraps sitting in the liquid, this will slow the process. You can pour the bokashi tea down your drain to prevent your drain from smelling or cloging. You can also dilute it and use it as an extremely potent fertilizer for your plants. 1 cup of Bokashi tea to 5-6 gallons of water. You must use it within 24 hours of removing it from your bucket. 7. Regardless of how long it takes you to fill your bucket, when it is full, seal the bucket tightly and wait at least 2 weeks for the fermentation process to complete. During this two weeks, do not open the bucket. If you can't get to it after the two weeks, no worries, it can sit for another week or so. Two weeks is just the approximate time it takes to break down the food. 9.Dig the bucket part way into the ground. 10. 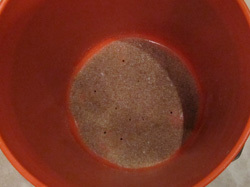 Place the contents of the Bokashi bucket with alternating layers of soil in the outdoor bucket. The top layer should be at least two inches of soil. Keep bucket away from prolonged exposure to sunlight or extreme tempratures. Bokashi has black or blue-green fungus Same as above. No bokashi juice (lechate) Moist foods produce juice. leachate is not essential. Bokashi juice (lechate) is a different or odd color The amount and color of the leachate depends on the type of foods fermented and can vary. Worm castings are often referred to as "black gold". OVermicomposting makes an excellent organic fertilizer. Worm bins do not smell because the worms eat the rotting or smelly portion of the food in their bin. As long as the bins are not overfed, there is no rotting food left to make an odor. 1. Either buy or build a wood or plastic container. When choosing a home for your worms, remember that worms hate light and require a temperature between 40 to 80 degrees F to survive. The bin will need aeration so the worms can breath. Plan on one square foot of surface for each pound of garbage per week. 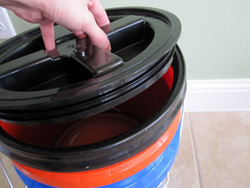 A 10-gallon plastic tub with a lid that snaps shut would be a good choice. Punch 1/8" holes about 1" apart around the sides of the bin to provide air for the worms. 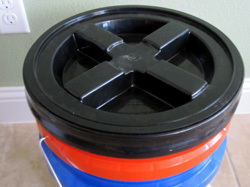 There are numerous vendors of vermicomposting systems, such as the Can-O-Worms™ system shown below. The best option would be to recycle something like an old dresser drawer, trunk, or discarded barrel. 2. Add bedding to the worm bin until the bin is 1/3 full. Suitable bedding materials include shredded newspaper and cardboard, shredded fall leaves, dead plants, sawdust, peat moss, compost and aged manure. If convenient, vary the bedding in the bin as much as possible, to provide more nutrients for the worms, thus creating richer compost. Moisten the dry bedding materials before putting them in the bin, so that the overall moisture level is like a wrung-out sponge. 3. Add a couple of handfuls of sand or soil to provide necessary grit for the worm's digestion of food. 4. 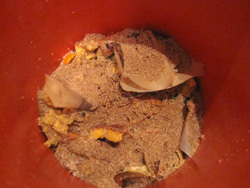 Add approximately a pound of worms for each pound of food scraps you plan to compost each week. The two types of earthworms best suited to worm composting are redworms: Eisenia foetida (commonly known as red wiggler, branding, or manure worm) and Lumbricus rubellus (also called the dung worm). Consider purchasing your worms regionally. One local vendor is listed below. The following vendor is located outside the North Texas region, but can ship worms year round. Mulch is used to protect precious topsoil and inhibit weed growth by covering the areas in landscapes where the soil is exposed. As the organic matter in the mulch decays, the released nutrients feed the plants and beneficial microbes in the soil. Mulch is typically a loose, fibrous material. The mulch must allow rain and irrigation water to reach the plant roots. To use mulch, apply a 3 to 6 inch layer around trees, shrubs, and within garden beds. It is not recommended to pile the mulch up against tree trunks. Don't Bag it! Participating in a "Don’t Bag It" program or "Grasscycling" means leaving the grass clippings on your lawn after each mowing. 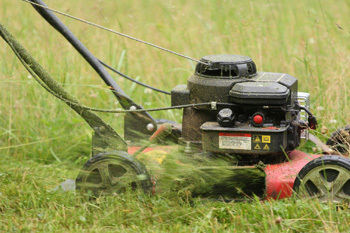 These grass clippings enrich your lawn with important nutrients and reduces the demand on diminishing landfill space. Several Cities across the DFW Metroplex offer free mulch to residents. Bring a container and a shovel because they are generally self serve. The City of Arlington offers free mulch to residents at the Arlington Landfill. The City of Burleson offers free mulch to residents at the Recycling & Compost Center. The City of Fort Worth offers free mulch to residents at three of their drop-off stations. The City of Frisco offers limited free mulch and compost from Texas Pure to residents at the environmental collection center. The City of Grapevine offers free mulch to residents at North Main and Dove Road. The City of Hurst offers free Christmas tree recycling in December/January and then free mulch in January. The City of Lewisville offers free Christmas tree recycling in December/January, then free mulch to residents in January. The City of Mansfield offers free Christmas tree recycling in December/January and then free mulch for "Mulch Madness" (dates vary). The City of Mesquite offers free mulch and compost to residents at their composting facility. 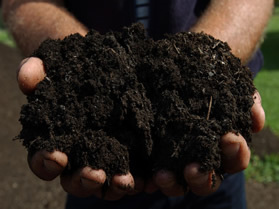 The City of Plano offers Texas Pure mulch and compost products for sale at a reasonable price. The City of Richardson partners with Texas Pure to provide mulch and compost to residents (See Plano). The City of Southlake accepts leaves and Christmas trees for recycling and then offers free mulch on select dates. *If you own a business that offers free mulch, please contact us to be listed on this page. Disclaimer: The presence of any business on this site does not imply an endorsement by NCTCOG or the TCEQ. Locations and information may be inaccurate or out-of-date. Please call the facility or visit their website to verify before visiting.